The Cincinnati Bengals coaching staff has historically been heavily involved with the evaluations of draft prospects and have placed a heavy emphasis on college production. Not very active on the trade front in terms of draft picks, the Bengals attempted to fill a need at tackle by trading for Cordy Glenn in an exchange of first-round draft picks from Buffalo (Cincinnati moved down to Pick 21 from Pick 12 by obtaining Glenn). Despite drafting tackles Cedric Ogbuehi and Jake Fisher with their first two picks in 2015, their need for a tackle exists as their 2015 duo has underperformed as neither has put forth a season grade above 67.3 overall. After the selection of speedy wide receiver John Ross in the first round last year did not pan out like many had thought, the Bengals could use one or more of their early round picks on perimeter weapons as they also have a need at tight end to add depth. They’ve also lost longtime backup quarterback A.J. McCarron during free agency, therefore a quarterback is not out of the picture to be selected at some point in late April. Cincinnati received four compensatory draft picks for the 2018 NFL Draft and will now have 11 total selections. Using our Wins Above Replacement (WAR – roughly the number of wins a team gets from replacing an off-the-street player with the player of interest) metric as a model, the aforementioned duo of Ogbuehi and Fisher each saw WAR values in the negative, proving the necessity to trade for Glenn. Running back Giovani Bernard‘s best season in terms of WAR value came as a rookie while on the opposite end of the spectrum, cornerback Darqueze Dennard finally generated >0.5 WAR in 2017, trending in the right direction. 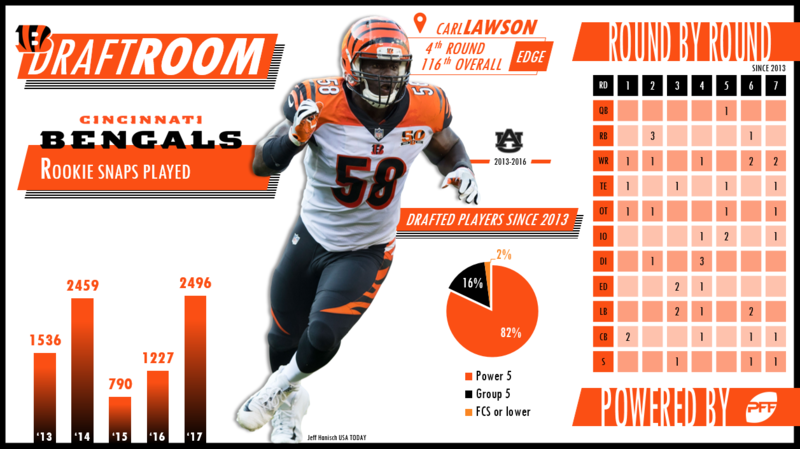 How Have the Bengals’ Draft Classes Stacked Up League Wide 2013-2017? Allowed just a 36.1 passer rating into his coverage in 2017, after missing all of 2016. Injuries have limited him, but he’s scored 13 touchdowns in 2015 to lead all tight ends. Versatile back has averaged 4.2 yards per carry and 1.54 yards per route run in his five seasons. Forced 18 missed tackles in the run game and three missed tackles in the passing game as a rookie. Earned 18 stops and 11 total pressures as a rookie in 2017. Allowed a 136.6 passer rating into his coverage in 2017. Caught just six of 16 targets in 2017. Earned just five total pressures and seven total stops in 334 snaps as a rookie. Earned a starting role in 2017 and struggled, earning just a 35.1 grade (fourth-worst among linebackers. Played over 650 each of the last two seasons, the former first-round pick has allowed 17 sacks, seven hits and 54 hurries in that time. Earned above a 50.0 PFF grade in just one of his four seasons with the Bengals. Left for Buffalo this offseason.